This section covers all aspects of wind industry technology, which has made rapid advances in all areas. Much has been learned, and more is to be discovered, in areas such as fundamental meteorology, aerodynamics and materials science as well as in highly applied areas such as maintenance strategies, wind farm design and electricity network planning. There are also as yet untried concepts for turbine design which may be worth serious consideration. Part I describes the fundamentals of wind technology, the current status and possible future trends. The methods for carrying out wind resource estimation are well established. 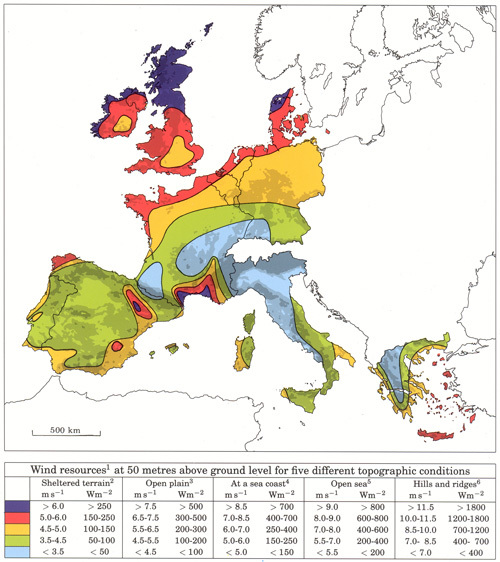 Chapter I.I describes wind resource estimation for large areas, carried out in order to establish both the available resources and the prime areas of a region. It also covers wind resource and energy production estimation for specific sites. The accuracy of the energy production estimate is of crucial importance to both the owner of the project and to the organisations financing it, and this chapter explains the many factors which can affect energy production. Forecasting is an increasingly important factor in the wind industry and this is covered in Chapter I.2. Depending on the structure of the electricity market, the owner of the project or the purchaser of the energy may be able to reap significant financial benefits from the accurate forecasting of wind production. Operators of electricity systems with high wind penetration also require accurate forecasting in order to optimise the operation of their systems. The technology has to compete on cost of energy against other renewables as well as conventional generation. Chapter I.3 thus discusses the evolution of wind turbine design and explains why three-bladed, upwind, variable-speed, pitch-regulated turbines currently predominate. The principal design drivers are now grid compatibility, cost of energy (which includes reliability), acoustic emissions, visual appearance and suitability for site conditions. Intermediate arrangements with medium-speed generators and reduced stages of gearing. Similarly, it is perhaps surprising that the optimum size of a wind turbine for ‘standard’ onshore wind farms is not yet obvious. The chapter explains some of these technical issues, and concludes by reviewing some radical alternative concepts. Chapter I.4 describes how wind turbines are grouped into wind farms, the factors affecting siting and how they are built. 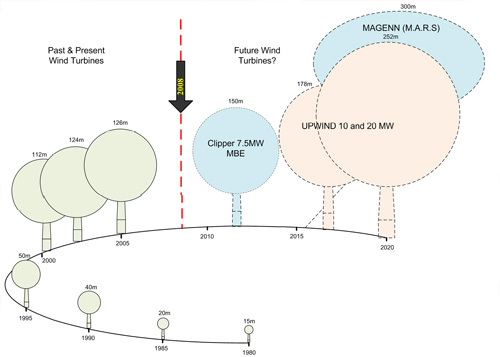 Wind farm design is a critical area for cost reduction and public acceptability, both onshore and offshore, especially with some sites now being bigger than conventional electricity generating plants. The arrangement of wind turbines within the wind farm significantly affects not only the energy production, but also the visual appearance and the noise influence on neighbours. This chapter explains how the layout can be optimised to take account of such constraints, using software designed specifically for the wind industry. The chapter also discusses the important issues in ‘balance of plant’ design, such as the civil and electrical works. As the wind industry gains experience in constructing projects in different conditions, the costs and other important issues are becoming clearly understood, and the risks should be no greater than other civil engineering or power station projects of similar size. Chapter I.5 covers offshore wind, and in particular extends the discussion of onshore issues in Chapters I.2, I.3 and I.4 to the offshore case. Although this market is currently substantially smaller than the onshore market, it now plays a fundamental part in several nations’ energy policies, and expectations are high. The offshore wind market is characterised by projects which are significantly larger and more risky than most onshore projects, and it appears likely that a different range of organisations will develop and construct these projects. Special vessels and techniques for constructing turbines have been developed, and the means of access to offshore turbines has emerged as a major issue influencing cost, availability and safety. 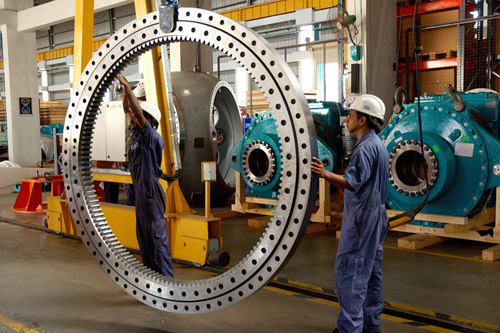 The turbine technology too is different for offshore projects: there are strong reasons why individual turbine size is significantly larger, and turbines of 5 MW or more are being aimed at this market. More subtle differences in technology are also emerging due to differences in environment and increased requirements for reliability. There is perhaps a greater probability of truly innovative designs emerging for the offshore market than for the onshore market, and the chapter concludes by reviewing innovative concepts such as floating turbines. At the other end of the scale, Chapter I.6 describes the small and very small wind turbines that are emerging to meet several distinct needs. 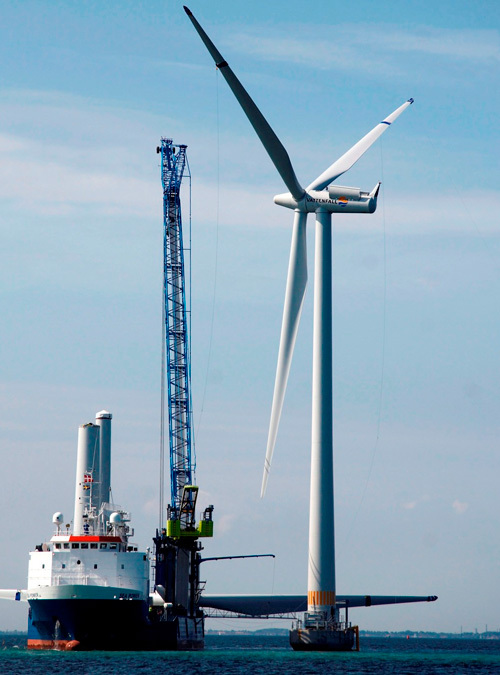 As well as the traditional areas of rural electrification and providing power to isolated homes, boats and telecommunications facilities, the prospects for significant demand for ‘micro-generation’ in urban areas is prompting technical developments in small wind turbine design, which could result in significant improvements in the economics. Furthermore, increasing fuel costs are encouraging developments in the technically demanding field of high-penetration wind-diesel systems. This wide range of markets, each with its own characteristics, means that the small wind turbine field shows much greater variety than that of conventional large wind turbines. There is great potential for growth in many of these markets. Chapter I.7 describes research and development (R&D) efforts in wind technology. A common misunderstanding is to consider wind energy as a mature technology, which could lead to a reduced R&D effort. The European 20 per cent target for the promotion of energy production from renewable sources poses new challenges. In its recently published Strategic Research Agenda, the European wind energy platform, TPWind, proposes an ambitious vision for Europe. In this vision, 300 GW of wind energy capacity would be implemented by 2030, representing up to 28 per cent of EU electricity consumption. Moreover, the TPWind vision includes a sub-objective on offshore wind energy, which should represent some 10 per cent of EU electricity consumption by 2030. An intermediate step is the implementation of 40 GW by 2020, compared to the 1 GW installed today. In order to implement the TPWind 2030 vision and enable the large-scale deployment of wind energy, the support of a stable and well-defined market, policy and regulatory environment is essential. The Market Deployment Strategy includes, amongst other aims, cost reduction and the effective integration of wind energy into the natural environment. One main concern is the R&D funding effort. Indeed the total current R&D effort for wind energy in the EU is insufficient to reach European objectives regarding the share of renewable sources of energy in the energy mix and to satisfy the Lisbon objectives for growth and jobs. The most critical component is the European contribution. The Strategic Energy Technology Plan (SET-Plan) has put forward a number of proposals to solve this situation, such as the European Industrial Initiatives which include the European Wind Initiative.